Just before midnight on 10th March 1973, after a private dinner party, Sir Richard Sharples, Governor of Bermuda, accompanied by his ADC, Captain Hugh Sayers, took his usual walk in the gardens of Government House. Sir Richard’s dog, a Great Dane called Horsa, hurried about in front of them. There was a light north westerly breeze and the air was thick with scent from the garden’s cedar trees which had begun to flower. It was the night of the annual police ball and there was just one unarmed man on duty at the main entrance. Given Government House’s sparse protection that evening, Captain Sayers took the precaution of carrying his 9mm Browning pistol. He was wearing a white dinner jacket which had been made for him shortly before leaving for Bermuda. It had been tailored to look crisp and streamlined, and carrying a shoulder holster and 9mm pistol had never been part of Hugh’s brief to Airey and Wheeler, the tropical outfitters. Horsa begun to growl at a cluster of hibiscus and oleander hedges which sheltered the tennis court. Captain Sayers immediately stepped forward in front of Sir Richard to see what the Great Dane was fussing about. The unarmed policeman at the main entrance later recalled that he had heard just four shots and, on arriving at the tennis court, found the lifeless bodies of Sir Richard, Captain Sayers and Horsa. We shall never know what really took place that sorrowful night. The newspapers of the day and subsequent inquiry suggest, however, that this description of the tragic train of events is close to the truth. 1973 was a year of ominous menace. The murders of Sir Richard Sharples and Captain Hugh Sayers were headline news but were soon forgotten in the gloom of the three-day week, the Yom Kippur war and OPEC’s oil embargo; the explosion of violence in Northern Ireland with over 500 people killed 1972-73, and the IRA bombings on the homeland. Sir Richard and Lady Sharples and Captain Hugh Sayers in the carriage en route to Government House, following the swearing-in ceremony. As an impressionable teenager who was toying with the idea of joining the Welsh Guards, the death of Hugh Sayers made a lasting impact on me. Few people join the Army in peace time for rational reasons or out of a sense of duty. Most of us are guided by our emotions, be it a family tradition and its sense of unfinished business; or a visit by an old boy to school, in my case Captain Robert Nairac, Grenadier Guards, a heroic captain of boxing at Ampleforth and triple Blue at Oxford, later to be murdered by the IRA and awarded the George Cross for bravery. Maybe it is just something which captures your imagination or a sense of who you’d like to become. 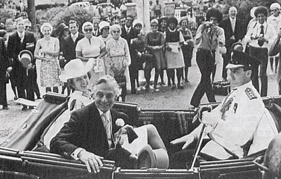 The article by Hugh Sayers in The Guards Magazine, ‘An ADC’s recollections of the arrival of His Excellency the Governor in Bermuda’ and the photograph of Hugh, resplendent in the Governor’s landau, promised a more glamorous future away from the bleak Britain of the early 1970s. Hugh Sayers was made of the right stuff. The phrase ‘Good in the field’ has shades of meaning, particularly in the Household Division at that time, often used to excuse a likeable but rebellious guardsman or scruffy young officer who took up rather too much of the adjutant’s time. But in Hugh’s case it was a true description of his temperament and talent. The photograph of Hugh on the beach at Arcachon in South West France was taken in the summer of 1971 by his close friend and brother officer, Peter Cheney. 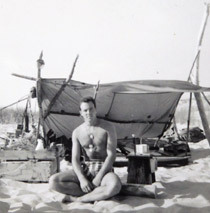 Hugh built a driftwood shelter on the beach rather than stay in some drab guesthouse. Hugh is wearing his dog tags in the photograph, his steadfast gaze and firmness of purpose with no hint of self-regard showing where his true heart lay. The shelter is orderly and unfussy. The bayonet stuck into the makeshift table next to his army mug adding just a touch of theatre. Hugh studied his profession, or at least those aspects he considered merited study. He became something of an expert on the French war in Algeria because he felt he could apply some of the lessons learnt there to the ‘Troubles’ in Northern Ireland. If Hugh took care over his own personal development, he also took great care over the wellbeing and professionalism of the guardsmen under his command. To some senior officers, Hugh was a bit of a maverick. When the Major General inspected the Battalion in Munster, Hugh led the demo platoon attack with his platoon wearing the uniform of the Waffen-SS and displaying all their fanaticism. Peter Cheney remembered with delight the horror on certain faces when Hugh was seen cutting his toe nails with a reindeer skinning knife on the Battalion’s tour of duty in Belfast in 1971. To his contemporaries, however, Hugh was an officer of delightful contrast. Elegant, enlightened and efficient, Hugh was as much at ease in the opera as he was in an OP overlooking the Falls Road. Hugh had set his heart on SAS selection, an endeavour and prize to which his brother officers felt he had a good claim. As the grandson, however, of Admiral Sir Ralph Leatham, Governor of Bermuda 1946-49 and possessing all the attributes of a good ADC, Hugh found his tour of duty in Belfast cut short and told to prepare for a change of pace. Life is full of ironies but none quite so tragic as the murders in Bermuda of Sir Richard Sharples and Hugh Sayers. Sir Richard, who fought throughout the Second World War with all three Welsh Guards battalions, winning the MC in the defence of Boulogne, wounded in the Italian campaign, a blameless political career, and whose eventual reward was the Governorship of Bermuda. Hugh Sayers, an officer of great promise, and whose appointment as ADC to the Governor was intended to smooth out his rough edges. 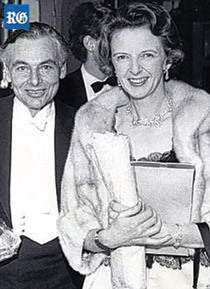 Sir Richard Sharples was fortunate in his friends and formidable wife. But it would be wrong to dismiss him as just a man lucky in friendship and his choice of companion. His war record spoke for itself. His Welsh Guards contemporaries spoke of his quiet, purposeful manner. Sir Richard took time and care in building his friendships but, once built, he kept them in fine repair. One such friendship was with Edward Heath, the Conservative party leader and prime minister from 1970-1974. They shared a love of sailing. Heath made Sir Richard minister of state at the Home office in his ill-fated administration but he resigned his position and his seat at Sutton and Cheam which he had held since 1954 when Heath recommended him for the Governorship of Bermuda. Lady Sharples, now Baroness Sharples and still in full sail at 95, remains a grande dame, the likes of which have steeled their menfolk to the business of Empire from the founding of the East India Company in 1600. Looking at the photograph of the couple, one could be forgiven for wondering who the consort was. In the aftermath of Sir Richard’s assassination, Lady Sharples also showed herself to be a woman of great grace. She insisted her husband should be buried on the island. ‘That is where his duty lay and so should he, Richard was doing such a good job, and so was Hugh. He was a very nice young man. And Horsa was a lovely dog. The children adored him’. No such grace was afforded to her by the Inland Revenue who insisted she pay the full death duties on their house in Hampshire. In their weasel words, ‘After due consideration, it is deemed that Sir Richard Sharples did not lose his life in the line of duty’. Lady Sharples had to sell her family home to pay death duties. She is nothing if not resilient and, in an interview with the Daily Mail in 2014, described her life after Bermuda as, ‘Killing off two further husbands, listening to crashing bores in the House of Lords, and hand-bagging errant cyclists running red-lights’. She described her own approach to life as, ‘Well, you’ve just jolly well to get on with it’. Once asked if she could pick one of her husbands again she replied, ‘I think Richard would aspire to be top of the list’. The Sharples’s Great Dane, Horsa, was buried next to Sir Richard. Great Danes did not have an easy time of it in those days. Just a year or so later, Rinka, a Great Dane and Norman Scott’s only companion after his affair with Jeremy Thorpe had come to an end, took a bullet for his master on Exmoor. Lady Sharples described the killings as ‘Temporary madness, my husband was sympathetic to the idea of independence’. The years that passed proved her right. In the early 1970s, the Black Power movement under its Svengali, Malcolm X, was at its peak. Erskine Durrant ‘Buck’ Burrows and his co-accused, Larry Tacklyn, were arrested in 1976 after an exhaustive investigation carried out by Commander Morrison from Scotland Yard. 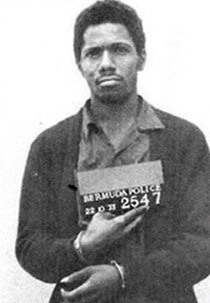 In his statement of guilt, Burrows said, ‘The motive for killing the Governor was to seek to make the people, particularly the black people, aware of the evilness and wickedness of the Colonialist system on this island’. Burrows and Tacklyn were convicted of the murder of George Duckett, the British police chief in September 1972 and the murder of two shopkeepers in April 1973. They were both hanged on 2nd December 1977 at Casemates prison, Bermuda. Tacklyn expected a reprieve as he had been acquitted of the murders of Sir Richard Sharples and Hugh Sayers. He was found guilty, however, of the murder of the two shopkeepers. The appeal for clemency went to the Law Lords (now the Supreme Court) but was dismissed. A petition for mercy with 7000 signatures was presented to Her Majesty The Queen in whose gift it was to overturn the Law Lords. Burrows and Tacklyn were the last people to be executed under British rule anywhere in the world. Sir Richard Sharples, Captain Hugh Sayers, and Horsa are all buried at St Peter’s Church in St George’s, Bermuda. Sir Richard’s coffin was carried by officers of the Bermuda Regiment. The Welsh Guards provided a bearer party under the command of Mickey Senior, a brother officer and good friend of Hugh’s. Charles Bremner, another fellow officer and close friend to Hugh and his family, accompanied and looked after the family in the days that followed. The graves remain beautifully kept and Mickey Senior, who visited Bermuda again in 1995 on duty as a Queen’s Messenger, wrote of the peace and serenity surrounding their resting place. Bermuda, an extension of the colony of Virginia, became a Crown colony in 1601, self-governing in 1620 and a British Dependent Territory in 1981. The referendum on independence was held in August 1995. 73.6% voted against independence on a low turnout. Hurricane ‘Felix’ had roared through the previous day. We often overlook Laurence Binyon’s enduring words in his poem, ‘For the Fallen’, ‘Age shall not weary them nor the years condemn’ because we have heard them so often, but as I penned the last few words to this article, I glanced once again at the photographs of Hugh on the beach at Arcachon and in the Governor’s landau. We can still envy his potential and the succession of green lights stretching ahead of him.